Here are some valuable lessons I learned from my father who is on vacation this Father’s Day. Most of these lessons I learned by watching him and his examples. Keep doing it until someone tells you don’t. This is applicable for things you are unsure about. Do what you want until proven or told otherwise. It’s never too late to learn. My dad is the perfect example for this. He didn’t start his bachelors until well into his 30s. 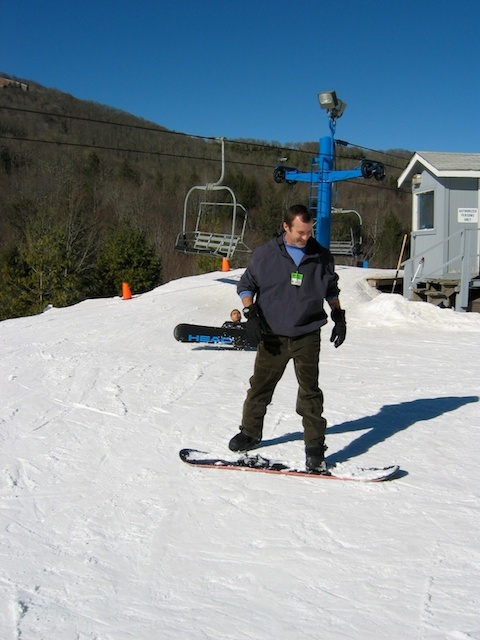 Now, he has a Ph.D. And the picture above is my dad learning to snowboard at age 51. Sometimes it is about learning life lessons and second chances. When things happen to you in life or you make a mistake, pick yourself up and keep going. My dad is a teacher at an alternative/reform school. There he focuses more on teaching his students life lessons rather than academics. In life, you need to know how to function as a person more so than you need to know what’s in textbooks. Find your happy place in life and go there often. My dad has hobbies, interests and likes. He’s an outdoor adventurous person who loves being outside. He likes to mow the lawn. He loves to ride his road bicycle and motorcycle. He is also a surfer who could live on the beach. And because he loves these things, he does them often. Happy dad = happy family. Life is an adventure worth exploring. Take the time to see new things. Observe what is around you. When you go on a road trip, stop everywhere. How often do we just do the motions and never even explore the sites in our own hometown? » Tell me… What are some lessons you learned from your father? aaaw, those were some awesome lessons! Number 3 was my favorite ~ “In life, you need to know how to function as a person more so than you need to know what’s in textbooks.” Wise, Wise words from a very wise dad!